Seoul National University scholarships are being offered to international students. Some are fully funded scholarships, and some are full-tuition scholarships for both undergraduate and graduate students. These scholarships are aimed to recruit talented and intellectually curious students to study at Seoul National University. The international students contribute much to increase the diversity of the campus which allows students to gain a global perspective of the world. Seoul National University is one of the best, if not the best university in Korea. It is part of the “Sky” universities (Korean Ivies) which consist of Seoul National University, Korea University, and Yonsei University. The university was founded as the nation’s first national university in 1946. As the first national university of Korea, Seoul National University has produced many influential leaders of South Korea in various areas such as politics and business. Since its founding, it continues to be one of the best in Korea and in the world. Seoul National University consists of 16 colleges, 1 graduate school with 99 programs, and 10 professional schools. It boasts 2,620 full-time faculty members, 5,313 total faculty members, 16,511 undergraduate students, and 12,119 graduate students. The number of international students in SNU is 737 with 3,899 students in Korean Language Program. With these many programs offered in Seoul National University, international students can study in a variety of programs that they are interested in. All of the majors that are offered in SNU are taught by the world-class faculty who have studied in excellent universities in Korea and in the world such as the Ivy Leagues of America. International students who receive these Seoul National University Scholarships will have the opportunity to study with the best professors in Korea and one of the best in the world. Also, Seoul National University has excellent research programs. 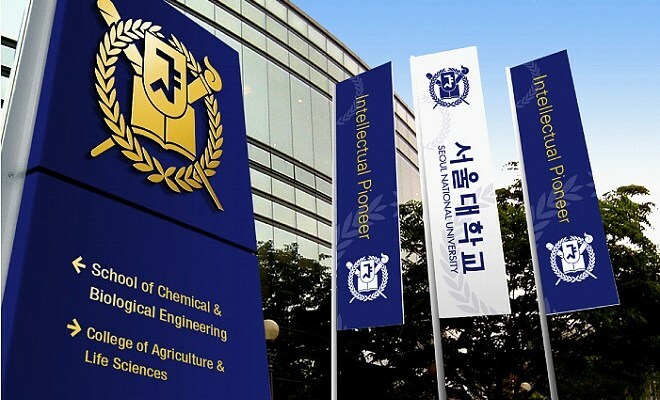 Because it is one of the elite universities in Korea, it receives huge sums of research funding from the Korean government and Korean Corporations such as Samsung and Hyundai. Because of these funding, the university has much money to spend in research, giving many students positions as research assistants and buying high-cost research instruments that are not found in most universities. The huge sums of funding have supported the researchers of SNU, and they lead the research in Korea as the result. Seoul National University tuition for international students is approximately $6,000 USD per semester. Students need to pay extra for room and board. However, if the student receives fully funded scholarships they do not need to pay Seoul National University tuition, room, and board. Seoul National University is ranked very high in global rankings. It is ranked 35th in the world by the QS rankings, the most reputable global ranking system. Also, it is ranked 10th in Asia. Another global ranking system has ranked SNU very high in the global ranking system, and it is ranked higher and higher as the years go by. The high Seoul National University ranking shows the university’s excellence in education, progressive research programs, and success of the graduates. Students from SNU have succeeded and will succeed in the future because of the excellent foundation that they have built in their years in this university. SNU offers generous scholarships for both undergraduate and graduate international students. There are two types of scholarships, one before application, and one after admissions. Scholarships that are awarded before application are based on the applicant’s high school grades and standardized test scores. Scholarships that are awarded after admissions are based on the student’s grades in the university. Please read below to see the list of Seoul National University Scholarships that are being offered to international students. Eligibility- Undergraduate international students who will be studying for 4 years. Selection Process- Applicants submit their applications to the Korean Embassy in their country. Embassy makes the first selection, and the National Institute for International Education make the final selection. For more information about Korean Government Scholarships, visit Korean Government Scholarship Information. Eligibility- International Students from developing countries in the DAC list of ODA Recipients. For the list of eligible countries, visit the List of Developing Countries. Selection Process- Applications are submitted to the SNU Office of International Affairs, and it makes the first selection. The Samsung Foundation makes the final selection. For information on these scholarships and other scholarships that are available for international students after admission, SNU’s List of Scholarships. Selection Process- Applicants submit their applications to the Korean Embassy in their country. Embassy make the first selection, and the National Institute for International Education make the final selection. Selection Process- Applicants submit their application first then submit their scholarship application to Office of International Affairs. Selections are made by the respective college, and the applicants are notified. Eligibility- International graduate students from “Silk-Road” countries who want to study humanities and social sciences. For information on these scholarships and other scholarships that are available for international students after admission, SNU Graduate Scholarships. Undergraduate- The application opens in January and closes in February. Graduate- The application opens in February and closes in March. Undergraduate- The application opens in June and closes in July. Graduate- The application opens in August and closes in August. If the application has been closed for this year, you can still find information and apply next year. A successful scholarship application takes usually from six months to a year of preparation which includes searching for scholarships, submitting the online application, asking for recommendation letters, preparing required materials, and much more. So, if the application date has been closed for this year, prepare your documents and submit a successful application next year. You can apply for Seoul National University Scholarships through an online application for both undergraduate and graduate students. To help with the application process, Seoul National University has prepared a comprehensive admission guide for international students. Please read the application procedures on their website carefully and follow the directions. To access the online application and the comprehensive admission guide, visit Seoul National University Scholarships for International Students. You should prepare the necessary documents and submit the application before the deadline. Also, to see the various scholarships available for international students, visit SNU Undergraduate Scholarships and SNU Graduate Scholarships.